One of only three men who were first across the Primosole Bridge to prevent the Italian demolition guard from blowing it, Cpl Johnny Simpkins had a deserved reputation for being tough, courageous and resilient but also for being the quiet, unassuming type who avoided the limelight but, to the universal recognition of his comrades, who "did the business". Born on 21 September 1920, John's family background was mining and his soul was rooted in Staffordshire. He left school at 14 and joined a local joinery firm. When he was 19 he hitch-hiked to London to work for a timber importer at Milwall Docks. World War 2 began for John in 1940, in a coffee shop in Lewisham when the windows blew in: the Blitz had started. He recalled having to walk back to his digs in Greenwich, witnessing docks on fire, bombs falling and Ack Ack fire on the way. 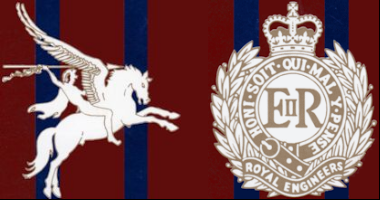 Realising that he would be called up anyway, he enlisted in the Royal Engineers and, after basic training and building runways in Islay with 664 General Construction Company, he joined The 1st Parachute Squadron in March 1942. By November he was on his way to North Africa as part of the 1st Airborne Brigade. His first operational parachute jump was followed by 6 months of hard, relentless fighting in some of the worst weather that North Africa produces. 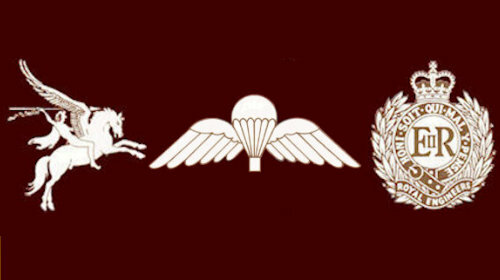 Happily the campaign had a successful outcome and the paratroopers who took part in it emerged with a fearsome reputation and a new nickname, bestowed on them by the Germans they fought — The Red Devils. In July 1943 John and his Squadron parachuted into Sicily to capture the Primosole Bridge. The parachutists were widely dispersed and only a few men showed up at the assault position. Undaunted, the attack went in, the bridge was captured. With two other men John captured the Italian guard force, before they could blow the bridge. No medal, no accolades, but job done: that was John. After Sicily, The Squadron spent some time in Taranto, Italy doing long-range patrolling and various Sapper tasks. In December 1943 they returned to England and were based in Donington, Lincolnshire. It was from here, in September 1944, that The Squadron departed for Arnhem. Among the survivors of that heroic battle, John was captured and he spent the next 7 months as a POW — stubbornly refusing, incidentally, to work for the Germans. It was a tough time of food shortages, inadequate winter clothing and deprivation that took extra-ordinary determination to survive. He was liberated by the advancing Russians and repatriated in May 1945. Palestine was John's next move — but not for long. He was demobbed in August 1946. Like so many of his peers he put the War behind him and went back to the joinery firm he had left to enlist. In 1950 he moved to the Midland Joinery Works, where he worked until retirement, as Chief Maintenance Engineer, in 1985. In 1953 John married Brenda Joan Hughes. Sadly, Brenda died in 1994 but John continued to enjoy the warm support of his close family for a further 22 years until his death, after a short illness, on 31st October 2016. He was laid to rest close to his home in Stapen Hill, Burton-on-Trent by his sons, Martyn and Michael, his grandchildren Dean, Scott, Dale, Joe and Emily and many members of his close family, by whom he is remembered with much affection.